Here's a rarity in my collection -- a volume of poetry and its sequel. 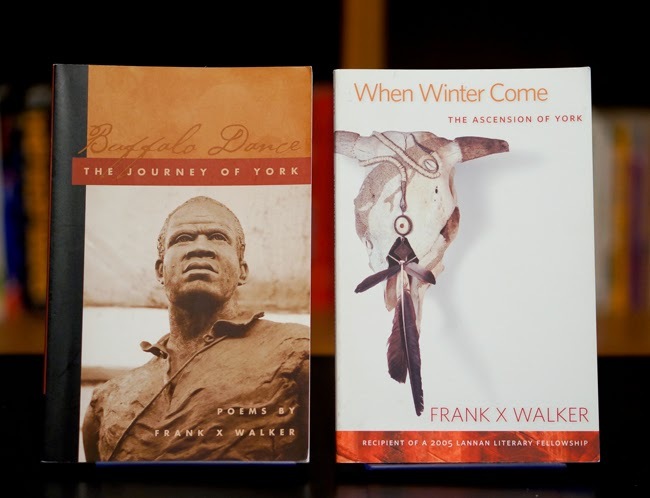 Frank X. Walker's Buffalo Dance: The Journey of York (2004) concentrated on York, the enslaved black man on the Lewis and Clark Expedition. Walker's When Winter Come: the Ascension of York (2008) was the sequel. I strive to note connections among books in my collection; Walker's Buffalo Dance and When Winter Come made things easy for me. 2013 - Turn Me Loose: The Unghosting of Medgar Evers. University of Georgia Press. Paperback. 2010 - Isaac Murphy: I Dedicate This Ride. Old Cover Press. Paperback. 2008 - When Winter Come: the Ascension of York. University Press of Kentucky. Hardcover. 2008 - When Winter Come: the Ascension of York. University Press of Kentucky. Paperback. 2007 - America! What's My Name: The "Other" Poets Unfurl the Flag. Editor. Wind Publications. Paperback. 2005 - Black Box: poems. Old Cover Press. Paperback. 2004 - Buffalo Dance: The Journey of York. University Press of Kentucky. Paperback. 2004 - Buffalo Dance: The Journey of York. University Press of Kentucky. Hardcover. 2000 - Affrilachia: Poems. Old Cover Press. Paperback.